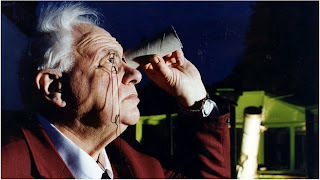 Home › Uncategorized › Sir Patrick Moore ~ a "true icon". Sir Patrick Moore ~ a "true icon". Sir Patrick Moore was a “true icon,” the chairman of the Isle of Man’s Astronomical society has said. Sir Patrick, who had been the patron of the island society since 1994, made several visits to the island. The British astronomer and broadcaster died at his West Sussex home on Sunday, aged 89. Society chairman Howard Parkin said he was a “great friend, a master of his topic and a true icon”. “He inspired so many including myself and it is a great shame that he has gone,” said Mr Parkin. Soon after be became the society’s patron, Sir Patrick helped to open the island’s main observatory in 1999. “He was a famous celebrity but he acted like the guy next door,” continued. “He was so friendly and polite and so enthusiastic on his topic. Sir Patrick wrote dozens of books on astronomy and his research was used by the US and the Russians in their space programmes. ‹ Something else for your Christmas list!